Small oil painting depicting cabbage trees tied together.. done in Naples yellow, burnt sienna and Indian red - size 140 x 200 x 15mm and for sale on trademe for a week. Pick some wild flowers, then hop on a bike and fly a kite? Do not try this at home, LOL. 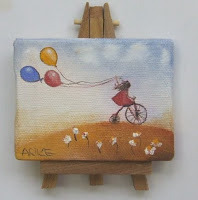 This is a miniature, only 70mm x 90mm and the easel comes with it. Enjoyed painting this with my oo and 000 brushes - fun!